Can nostrils be narrowed to look natural? Many rhinoplasty patients are interested in narrowing their wide nostrils at the base of their nose but many are afraid of obvious scars or of having a distorted or pinched look. There is the potential for these sorts of problems if nostril narrowing is not planned and done properly but, with care and appropriate technique, this can be a really nice finishing touch to a great rhinoplasty. 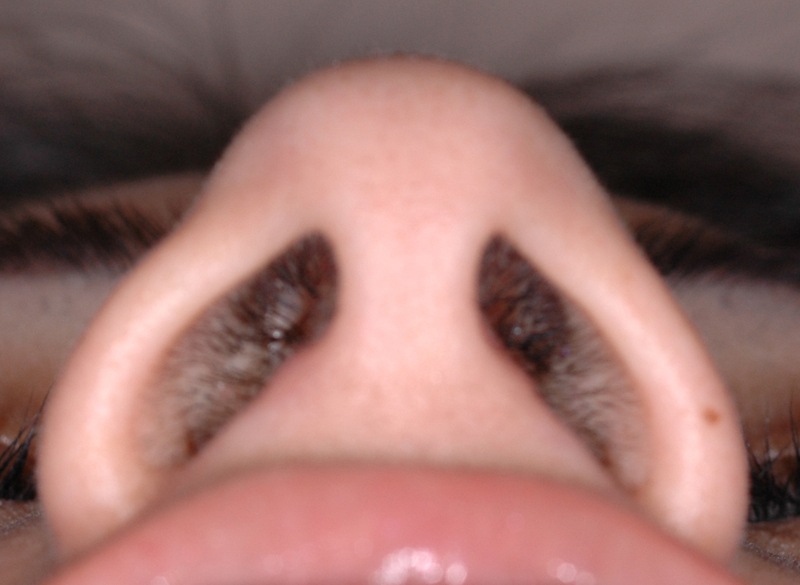 There are a few different techniques for narrowing wide nostrils, known as alar base reduction. The 2 most popular techniques are shown below followed by the technique that we use. We’ll illustrate for you how it is done and the effect that each technique has on the nostril shape. The photos above show the most popular technique for nostril reduction, called Weir incisions. This involves removing a wedge of tissue from the edge of the nostril where it meets the cheek (shaded in blue). The arrow indicates the direction in which the edge of the nostril is then pulled down and re-sewn. While the scar is well hidden here, it has a tendency to flatten the nostril by removing its natural curvature. When done over-aggressively, the tip can take on a very unnaturally pinched triangular shape as seen on the right. When too much skin is removed, the skin closure is under tension and can result in a poor scar that will need further treatment to get it looking acceptable. The photos above show another common technique for nostril narrowing, called Joseph incisions. This involves removal of a wedge of skin from the base of the nose in an area known as the nasal sill (the blue shaded area). The edges of skin are then pulled together in the direction of the arrows under some tension. Again, over-reliance on this technique can cause scars that are widened and nostrils that appear abnormally notched as shown in the photo on the right. The final set of photos above demonstrate our modified alar base narrowing technique. This is the method we use for Beverly Hills nostril reduction in our patients. Our method involves removal of a crescent-shaped wedge of skin from the sill followed by incision just above the nostril crease. The entire nostril is then moved inwards in the direction of the arrow to recreate a normal nostril contour. The benefits of this technique are numerous. The scars are well concealed under no tension whatsoever, so they tend to heal invisibly within a couple of weeks even in ethnic patients and thicker-skinned patients. The natural curve of the nostril is maintained. The normal crease between the nostril and cheek is preserved. And, best of the all, this one procedure can be individually tailored to each nose to variably address nostril width, nostril flare, and to improve the internal shape of the nostril. The simulation on the right shows how this technique can achieve a beautifully-proportioned natural nostril narrowing. Check out our dedicated rhinoplasty site or our online rhinoplasty textbook for more details.